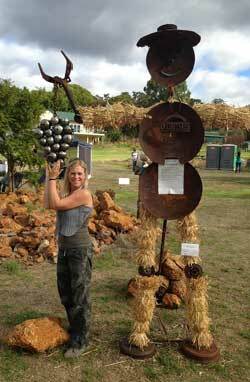 Carldenn Homestead Wines is located in the Perth Hills Region amid stunning scenery of the Darling Scarp. The property slopes into the afternoon sun and the vines are grown on famous red gum gravely soil high on the western ridge of the Bickley Valley. These elements combine to produce elegance and subtlety in our wines. This five acre property's first 4,000 vines were planted in 1998. 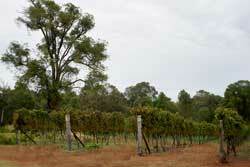 These produced some very nice Award winning Chardonnay and Semillon wines. Since 2002 we have also ventured into producing Merlot wines and our latest venture is with a Classic, Sparkling wine. Both Carline and Dennis come from the Kalamunda District and theirr four children on Carline's side are 6th Generation West Australians, arriving in 1829 on the “Caroline”. On Dennis's side they are mere 3rd generation West Australians. Both played a lot of sport in their younger days, mainly football and cricket for Deniss and netball for Carline. Both went to Kalamunda High and Dennis was in the 3rd year of the high school in 1963. The high school celebrated its 50th anniversary in 2011. They married in 1972 and spent 12 months over east which included New Zealand and Tasmania working their way from Sydney, Brisbane, Albury and Geelong. A fantastic experience and glad that they did it before the kids came along. Driving through Victoria gave them ideas on how to build a house for Australian conditions and the house they have is a direct result of the old colonial houses in the Riverina District of Victoria. Both came back and purchased our 5 acre property in late 1976 which was park land cleared which means not much scrub but an even spread of trees. A terrific setting with orchards on their western side and forestry on our eastern boundary. The north western aspect lent perfectly for agriculture and the gravelly loam another great quality. They worked hard to establish the house and garden because, as you know, planting trees means finding a spot deep enough amongst the rocks. Later post holes for the vine yard meant hiring a rock breaker. A major job was finding water which meant hand digging a well 40 feet deep for a poor result, but they did survive from the water from the well for about ten years when another well was dug, by machine this time, in the bottom corner of the block. This time they hit a good supply enough to irrigate a market garden and orchard plus enough for the house. In 1998 they decided to establish a Vineyard. 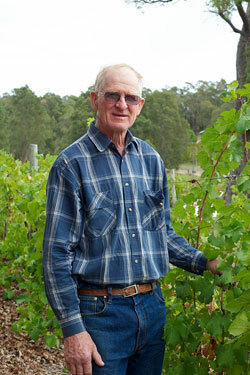 After getting advice from Peter Fimmel, the local wine guru of the time, they planted Chardonnay and Semillon, two whites which are well suited to the soil in this area. For the first two years of production they sold the fruit off to a winery in the Swan Valley, then managed to get a contract with Oakover Winery to buy my grapes. After two years they were given the choice of not being able to sell the grapes or go to bottling and opening a cellar door. They took the bottling option and for two years Rob Marshall from Oakover made their wine. Rob made good wine and they won silver and bronze medals with their 05 Chardonnay and 05 Semillon and followed up next year with three more bronze medals. At the end of 06 they parted company and we were left without a wine maker, but by fate they happened to meet Alon Arble from Bella Ridge Estate. This was a stroke of luck fas Alon has made terrific wines for them including a fabulous Sparkling, an amazing range of Classics and the best Cabernet/Merlot. Alon's style of wine making may not appeal to the judges but they are made to appeal to customers, as evidenced by sales. As the judges operate under set guide lines and anything outside the square does not get a look in so we don’t have much faith in judges, but and more faith in our customer’s opinions. Sales are still improving year by year as this business is a long term industry which requires hard work, persistence, determination and passion.